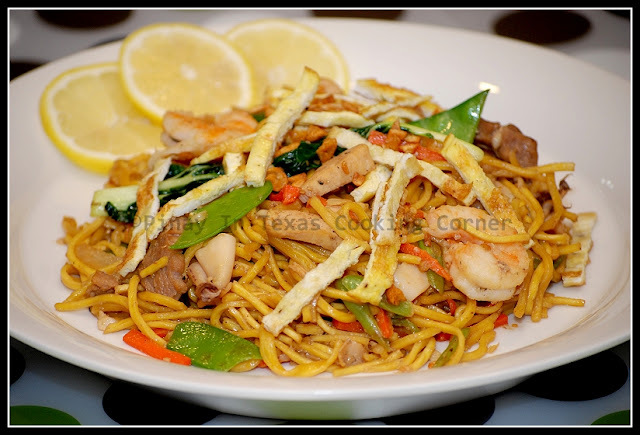 Pancit Canton is another dish of Chinese origin that has very much become a part of Filipino cuisine . Just like pancit palabok (the very first recipe I shared with you here), pancit canton is one of the many pancit variations in the Philippines. In pancit palabok, we use bihon or rice noodles, while in pancit canton, we use canton or egg noodles, which is the dried type that is flavored with crab or shrimp. When cooking pancit canton, there are several ways of preparing the noodles. The most common method is to blanch the dried noodles in boiling water for a few seconds then draining them before stirring into the sauce. Some blanch the noodles, and after draining, lightly fry them in oil. Some like it crispy so they plunge the dry noodles in plenty of hot smoking oil until puffed, after which the meat, vegetables and sauce are poured over the fried noodles arranged on a serving plate. Pancit canton is my daughters’ all-time favorite noodle dish so I cook it very often. Based from experience, blanching the noodles makes them soggy so I don’t do it. I prefer that they cook in broth so that they can absorb the flavor of the meat and/or seafood that I'm cooking it with. Pancit canton is a very flexible noodle dish. You can cook this with whatever vegetables, meat or seafood you want. Want cauliflower? Bell pepper? Broccoli? Shrimp? Squid? Chicken? Pork? Go for it! No matter what you decide to add on it, it will surely be yummy! 1. In a wok , over medium heat, saute garlic in 2 tbsp olive oil until light brown. Add onion. Saute until translucent. 2. Add vegetables and shrimp. Stir-fry until half cooked. Add fish sauce & a pinch of black pepper. Mix well. Transfer to a plate and set aside. 3. In the same wok, add the remaining 2 tbsp olive oil and stir-fry chicken and pork until light brown. 4. Add squid. Stir-fry for a minute. 5. Add broth, shrimp extract, oyster sauce and soy sauce. Bring to boil. 6. Add noodles. Mix well with other ingredients. While constantly tossing, simmer until noodles are done. 7. Finally, add vegetables and season with pepper. Mix well. Remove from heat. Hi Tina! Did you boil to soften the noodles a little first? Hi Tina, I made this for dinner and my son even asked me if he could take some in his lunchbox! 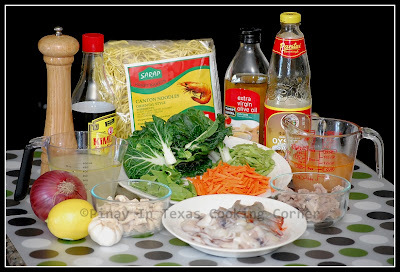 I was wondering if you were familiar with the Chinese-Filipino long life birthday pancit if you have a recipe. I'm not sure if you are familiar with it,but I remember it had pink quail eggs,fish balls, and a whole lot of things!